A group of civil rights activists gather every Tuesday and Thursday between 6:00 and 8:00 PM in the park at 31st and 41st, at the corner of the “League against Blindness” hospital, very much in tune with the function of activists to tear off the Cubans’ blindfold and teach them to overcome their fear. To carry on his example and in memory of one who was vilely murdered, they began to meet the same day the dissident Juan Wilfredo Soto (known as “The Student”) was buried, and branded this day as the birth of the Citizen Evening. In the beginning there were three who started the Evening, then five, eight, nine, ten, eleven, twelve, thirteen, fourteen defenders of a free space, who have resolved to pay the highest price. They come from all directions, with saddened faces. It’s time for those who have heard the call. They don’t know what’s in store for them for the rest of the afternoon. On previous occasions they have been arrested, beaten, threatened. But despite everything, they find a glimmer of nobility invades them and they embrace each other. While members of State Security remain on the lurk, the dissidents help to chase away the fear by conversing on specific topics, “The concept of possible unity”; “The need to implement the affective element in civil society”; “Tolerance”; “Absolute respect for individual freedom”. “We try to learn to be citizens,” one of the youngest people, Yaroslan Tamayo Rueda, told me, without losing sight of the two agents who pretended to be chatting. I look over the faces of the group of dissidents, looking for the answer that summons several generations to meet, what motivates them to run the risk, despite the harassment and abuse: professionals, workers, a peasant woman, blacks and whites. I talk with them and learn the reason that unites them: CHANGE. They need progress, freedom. José Alberto Álvarez Bravo, as his second surname attests, has suffered six arrests. Threats to send him to prison, even death. He pauses, looks around or into the void, trying to let his eyes rest in the distance. And he calls to Inés Antonia Quezada Lemus, one of the courageous Ladies in White. “Show him,” he begs her, “the bruises you received at G and Calzada streets.” She, without much interest, shows some marks that refuse to go away. Inés calls José Ángel Luque Álvarez to come over. The shy young man shows me a string of cuts on the arms. He states that the military men, in exchange for granting gifts, would incite the common prisoners to beat him. In solidarity, a girl watching from a nearby bench alerts us to the fact that they are taking photos of us. “Don’t give them an importance they don’t deserve,” says Leidi Coca, another of the Ladies in White. Someone in the group says that, sadly, we need to break it up because it’s 8:00 pm. “And now we wait again, five days, to revive this space of freedom not governed by the Castro brothers,” laments Inés Antonia. Each of us expresses the feeling, the experience that goes through our bodies and minds as we inhabit a space, miniscule for now, of total freedom. Finally we give a parting embrace to those mentioned before and to René González Bonella, Florentina Machado Martínez , Pedro Larena Ibáñez. We go away fearful, but with the firm determination to return the following Tuesday and bring that space of freedom back to life . José Alberto Álvarez Bravo has been detained since September 20th, when he was on his way to participate in one of the Citizen Evenings. 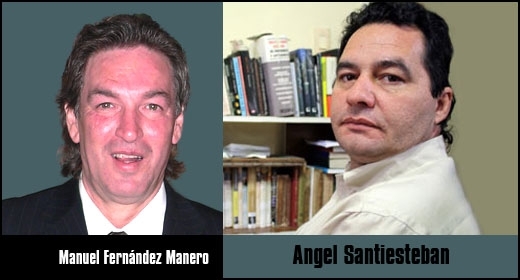 Manuel Fernández reveals in Incredible Universe how, when he met the Cuban writer Angel Santiesteban, State Security recorded the conversation. A Spanish citizen, Fernández was the manager, at that time, of one of the hotels in Havana. A few days ago we talked to him about the regime’s campaign against Santiesteban and he was inspired to recount to us what happened at that time, a sincere testimony about the struggle for life. These are the words of Manuel Fernandez. He lives in Spain. He continues to admire the Cuban intellectual and warns of the government’s maneuvers to totally silence him by sending him to prison. I met Angel Santiesteban like most of his current best friends, through his books. Through someone I can’t remember, his books came to me, and I then decided to meet him. His literature overwhelmed me, but especially his knowledge of the Cuban reality. In Cuba I was devoted to tourism, I was the manager of the Deauville Hotel, and could rub shoulders with all strata of society, knowing that many wouldn’t risk talking in the light of day for fear of the consequences. I told a mutual friend I wanted to meet him, I wanted to talk with that writer who scoffed at the canons established by the system. Writing in this raw way within the system was certain suicide. Honestly, I imagined someone half crazy with the airs of an alien, but above all with talent and determined to write the Cuban reality and that was what interested me. When I met him he wasn’t what I’d imagined. He conversed calmly and the whole time it seemed to me that he knew what he wanted, where he wanted to go. We talked of common themes: literature, society, ideology, the dictatorship, the future of Cuba. And at that time — it was six years ago — Santiesteban was pessimistic about a democratic solution in the coming years, because in those years, in Cuba and in the world, there was little evidence of the Castro brothers abandoning power. He said no, they adjusted to the times. He assured me that Fidel Castro had become a specialist in playing for time and in manipulation. All he wanted was not to lose power. At times he seemed disposed to make concessions, to appear to be preparing the changes the country needed, particularly for democracy. And time has proved Angel right. Fidel and Raul are still in the same place after more than fifty years, feigning change to gain the time necessary to ensure “tranquility” for the rest of their lives. 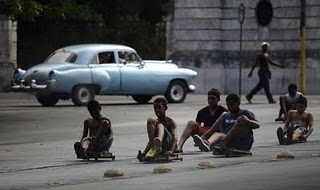 This supposed “tranquility” is nothing more than continuing in government, betting on Alejandro and Mariela Castro, Raul’s children, as the racehorses they’ve allowed to play a different game, a measuring stick to gauge the desires and wishes of the Cuban people. And at the same time to save their fortunes and to gain time to get their family members out of the country. I said goodbye to Angel, assuring him I would return in a few days, and even promised to bring him a book by the journalist Jose Manuel Medem who had recently ended his contract as a reporter in Cuba for Spanish Television. I couldn’t return, they didn’t let me return. I learned that State Security had recorded my conversation with Angel that first time we’d met and that I was definitely not welcome in Cuba. Since then I’ve followed Santiesteban’s life, thanks to email, and after they closed down his account we sustained our conversation on Facebook, which is like sitting at home carrying on a natural conversation. I have supported Angel in the advocacy campaigns every time they’ve abused him. I have always been at his side and always will be. It’s a promise that I made to him and to my son. I will never abandon him. Every outrage has been a pain in my own flesh. I suffer it double because I want to be in his skin, to receive these injuries in his place, I can’t be at his side physically to ease it every time State Security decides to hurt him. My cry for Angel goes out from Spain to every corner of the world, I do it for our brotherhood, my family has already accepted him as one of us, very special of course; but I also do it for the intellectual that he is, for his work and for the need Cuban culture has that he continue to develop his talent and enrich the literary landscape. Also for the natural fighter that he carries within, for all he sacrifices so that Cubans can be free and obtain the rights defended by the Constitution of the Human Rights Organization of the United Nations. Of course we are worried about the General Prosecutor of the Republic’s request for 15 years for Angel, we know that it is a campaign, first to intimidate him, and then to discredit him internationally so that his denunciations in his blog will not be believed. They know that Angel is a strong writer, that he has made his talent into a powerful weapon against the system. And for this they try to destroy him, to make him give way with these dirty media tricks. Angel is going to continue writing his blog with the same strength with which he began it. He is going to continue to delight us with his literature. We will not allow him to be imprisoned. These are the convictions with which we support him and with which we will do everything within our power, and more, because justice must prevail once and for all, the Castro dictatorship must understand that there are men who can overcome fear. Link to the interview, in Spanish. I know that logically I don’t have to respond to the mostly anonymous commentators in Internet forums. But this time I’ve decided for forget protocol to respond here because so much raving frightens me. I don’t deny the education that I received, but I most thank my mother, who often skipped breakfast so that her children could go to school with something in their stomachs. There is a misconception, that the Government has given a gift, as they say, a “free” education. We know they have no way of getting the money other than through the sacrifice of the workers, so it was our parents who paid for our education, which would be a great contradiction, if our parents paid, and if you put a high price on our education, then how “free” are we talking about? You know, I never wanted to be a politician, I think the extreme sides should come together, so if you see in me a desire to go into politics you’re mistaken, of course, I always said I was an anarchist, but later I learned that even silence is political, whether we practice it consciously or unconsciously. If I had wanted to be a politician, I would have done it many years ago, but notice that I never jumped at the chance. 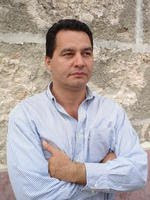 In 1992, after learning that I had won the Casa de las Americas prize with my book South: Latitude 13, minutes before delivering it they let me know that I would not receive it, that State Security intimidated the jurors, if you don’t believe me ask Abilio Estevez who ashamedly explained it to me. And since them I knew to shut up because I never wanted to be recognized for extra-literary scandals, although somehow I was. In 1995 I won the writers’ guild, UNEAC’s, most important prize and the book wasn’t published until 1998, after half the pages were censored. In those three years I shut up because I still didn’t want to be an international scandal. In a dossier prepared by the Casa de las Americas about the literature of my generation, they asked for a story from every writer, and despite my having sent five stories none was chosen. And I still shut up. Then, recently, in 2006, I won the Casa de las Americas prize for my book Blessed Are Those Who Mourn, and according to what they said the book would be printed for the next call. I had to wait two years to get it into the hands of readers, after several conversations with the Department’s organizer for the literary event. And I kept silent. Keep in mind, if my intend is to take advantage and become a dissident I spent two years supporting this research to see if they were withdrawing because, of course, the accusations embarrassed me although I knew myself to be innocent and wanted to avoid scandal. With respect to emigrating, with all due respect for those who have and their reasons for doing so. I personally have visited the U.S. on more than one occasion, invited by universities because of my intellectual work. Despite the pleas of my family and friends that I not return, here I am, hearing someone tell me to take advantage of the circumstances to emigrate. As for my broken arm, if you search in Google, you can read that the cast was put on a military hospital: The Naval Hospital I said it was at the time, but in addition the Ministry of Culture asked the Interior Ministry to initiate an investigation, to silence the protests of international opinion. An investigation that, at least for myself, I never knew what determination they came to. In any event, it’s a bit laughable that they are seeking, and so much so that instead of investigating the phantom attackers, they did it with me and I said at the time the name of the Lieutenant Colonel who led the supposed investigation, that in fact was dedicated to pursuing my friends, rounding them up for twelve hours of interrogation about my life, what I did, who I saw, if I talked to foreigners, etc. So, needless to say that if they had questions about my fracture, going to the hospital and interviewing the military doctors who treated me would have been enough. But if that’s not enough, the questioner can write to my personal mail and I will send them an image of the medical certificate and the x-ray. For the rest, I posted the name of my lawyer and the Collective Law Firm where she works. With respect to Yoani Sanchez, whom you mention, I would be impossible for me to reach or exceed her, she is an icon within our society, and if we can be of any use to her it is to protect her, to offer her out shoulders so that her voice continues to be heard, and so that all of us know what she says. What else could I offer you but good luck with this innocence you possess. Don’t worry, I understand, most of us were like you. If I’m not mistaken you could be a foreigner, because so much innocence is impossible to maintain here, inside, not even the Communist Party members themselves are so candid and recognize what is happening inside the country. What’s more, on my travels through the world I could meet many romantics like yourself, who see Cuba through a lens of idolatry, who see Fidel Castro as a paradigm, but never, unfortunately, thing of the sacrifice of the people of Cuban, the price we pay for their utopias. These defenders of Cuba, some professors at major universities, bright middle-class professors, after defending the Cuban regime at all costs, commented bitterly to me that they were going to go on strike the following day to demand salary increases. And I couldn’t stop looking at the residences where they lived with their families, children in private schools, their unused swimming pool, their expensive cars. I could never help but wonder how long they would continue to support the regime of Fidel Castro, when they had to go out to get on a bus packed with people, and get home not knowing what they were going to cook for their children. And look at their worn out shoes and remember that they had a hole in the sole of their own they were constantly trying to hide from their colleagues. But that mental exercise wore me out. Nobody wants to look beyond their own prejudices. Finally, to ask some European president, as you mention, out of kindness, to give me asylum, but you know that not all the prisoners of conscience left prison and decided to leave, some stayed in prison because they refused to leave the country. Anyway, I thank you in advance but reject it. I’m staying. Here I first saw the light of day, and here I will see it for the last time. But without being President, save of my blog, I ask you to come and live in Cuba. Later you can tell me how much pretense there is in your words, how mistaken your look. The sad thing is to be blind when you think that from a watchtower you can make out the horizon. It is my desire to instruct, read the books by writers who have fled their country. Read the bloggers of Vocescubanas.com [which you can read in English in TranslatingCuba.com], come to Cuba and get off the bus, walk the nearby streets. Leave the tour guide and find your own people to talk to, those who do not have a speech they learned to serve as a shield not to be persecuted. 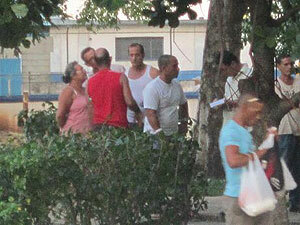 Don’t stay in the hotel swimming pool, walk along the Malecon, and enter the Cuban reality. Don’t waste time with the shows at the hotel. Go to the theater, you can see the dilemmas facing today’s society. Don’t just buy traditional music, which I recommend, but also music that is not promoted, music whose songs are passed — thanks to Bluetooth — from cellphone to cellphone. Hopefully my request doesn’t seem offensive, I’m just trusting in this naiveté that has exceedingly touched me. Accept my greeting and much luck to you. Related article: Declaration of Principles.